Thank you for selecting Dr. Fern for your retinal needs. We hope to relieve your anxiety and provide you with high quality retinal expertise and state of the art technology in a pleasant and comfortable atmosphere. Our mission is to provide quality compassionate retinal care to you and your family. 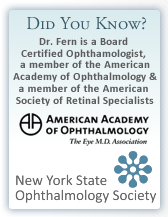 Dr. Fern is a Board Certified ophthalmologist and retinal surgeon who specializes in diseases of the retina and vitreous.